A roof brace kit is recommended for areas that receive frequent heavy snow or installations where tree branches are likely to fall and strike the shed. A foundation kit will provide a manufactured base on which to assemble your shed. Attractive, horizontal siding combines with a vinyl coating to give you a handsome and durable storage solution. An ample high gable roof allows for plenty of headroom with space to work, hang tools and store equipment. Long-lasting vinyl-coating over galvanized steel is abrasion/scratch resistant and provides a five times thicker finish than standard steel buildings. 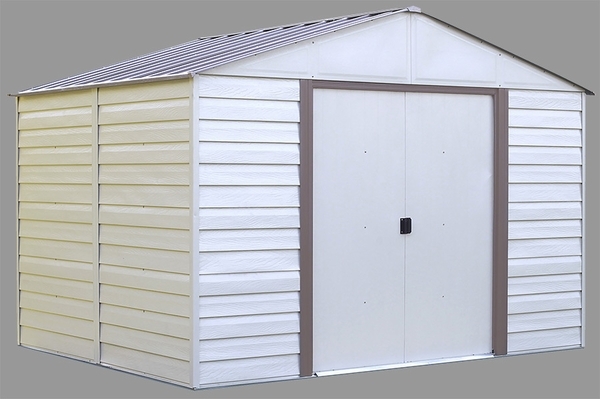 This Vinyl Milford 10' x 12' shed boasts 115 sq./ft of storage. How tall is the door opening? The door opening on this shed is 64.5 inches. Although I won't know everything about how the shed performs until it goes through some Sierra Nevada winter winds, overall it went together easily and is sturdy. The manual could use some clarifications in some areas though. This is a nice shed. I'm happy with the quality of the product. I already had a Milford 10 x 8 that had been built by the previous owner about 20 years ago. I needed more storage and was impressed by the durability and simple style of that shed so I decided to build the 10 x 12 right next to the old one. I guess I took the warnings to start with a level and perfectly rectangular base seriously and I was rewarded by a smooth and effortless assembly. (I built a base using pressure treated lumber and a plywood floor instead of using the free floor base that came with shed. )I kept on expecting holes to not line up like in some other reviews, but that never happened. The design and construction method were clever and everything went together exactly according to the instructions. Maybe other owners didn't read the instructions? Did I mention I was able to build it without help? Having one stepladder inside and another outside when putting the roof panels on made this easier since I didn't have to keep moving a ladder. Finally, for 777 dollars and a couple of days of my time I feel I got a handsome deal and a shed that will still be looking good in 20 years just like its older brother. ProsRoomy with good head room too. At 777 dollars for a vinyl coated 10 x 12 shed this was a great deal. Clever design- all holes match up and all hardware supplied. ConsI wish Arrow made a 10 x 14 Milford. Item is better than expected. Super price. ConsAssembly... As expected lots of parts but a no brainer to assemble with 2 people. Plus I saved $250.00 to do myself. This shed was easy to assemble. Other brands often have leaky roofs, but this roof has not leaked at all. We are shopping for a new Arrow shed because after twenty great years a record snowfall in 2010 destroyed it. It was an excellent shed and I would have installed the roof reinforcement kit if I had knew about it when we first got it (it would probably still be standing with that kit). The value at this price is excellent and it the build on this kit is just as easy as any other shed kit. I love my new shed! It was very easy to put up. The three-by-six box the shed comes in was unexpected as it was my first shed. After it is put together it seems durable and looks like it could handle the weather where I live (San Diego). Made a lot of mistakes when putting it together (the manual could have been more detailed), but after 3 days of doing and re-doing different parts I managed to get it together. After seeing a shed my friend has I had expected something much different. His shed uses a tongue and groove system to go together and feels like it is better quality than mine. Whereas his panels are thick, the ones that came with this shed are flimsy and feel like lower quality vinyl. The amount of time they recommend for building it is definitely on the small side. It took me around 24 hours of work to get it together (including the floor and trying to get the panels together). Even though I was expecting a better vinyl than this shed came with, after construction it feels solid and works (except for a leak in the roof). I would probably get a more solid vinyl shed if I chose again.